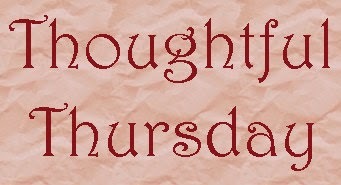 It is time for Thoughtful Thursday and the bookish questions that pop up while I am reading. Please share your thoughts on the bookish question of the week. I am curious to hear what you have to say! There are no wrong answers. Questions about Thoughtful Thursday or future Thoughtful Thursday posts? Check out my Thoughtful Thursday section. Ack! I totally forgot to add more questions on Sunday. There are more questions in the Thoughtful Thursday section now. Alright, on to the question! This question popped into my mind after seeing a new book by Ann M Martin (the original author of The Baby-sitters Club series). When I was a kid, I thought Martin had written all of the books. As I teenager, I was shocked to discover that so many of my beloved series (e.g., The Baby-sitters Club and Nancy Drew) were not all written by the same two authors. Okay, I wasn't too surprised that the Nancy Drew books were written by different people, because those books had been published for ages and there were different Nancy Drew series that I preferred over others (I loved the Nancy Drew & Hardy Boys series and the Nancy Drew Files series). When I discovered that The Baby-sitters Club and the Nancy Drew books weren't all written by the same authors, I was shocked (it had never occurred to me that the author on the cover wasn't the real author), but it wasn't too surprising, because both series had hundreds of books by the time I discovered the series. At the same time, the idea of reading a series that had gone through different writers' hands felt a bit odd. To be clear, I was okay with the ghost writing, it was that multiple people had been the lead writer for a series. The issue of different authors for a singular series hadn't been a big issue for me for most of my reading life, outside of some of the middle-grade books I read when I was younger, until recently. When I started reading a lot more a few years ago, I discovered all sorts of interesting book scandals. For example, I learned about adult children continuing their parents' series (sometimes with their own names as the authors and sometimes listing their parents as the authors). From what I saw, it appeared that no one felt that the children's books were in the same galaxy as their parents' books. I also learned about authors being fired/let go from a series and publishers continuing to publish the series with new writers but with the original author's name. Isn't it scandalous?! I am holding off on listing the series names here, because I only know enough details to be dangerous, and I don't want to say something that isn't correct. So, the big question is would I read one of these series that had been taken over by a new author? Hmm, this is a tricky question. My gut reaction would be no, but I think the real answer would be it depends. I think the reason that this question feels tricky is that I feel like I am cheating on the original author. Author X and I had a committed relationship. It feels wrong to set out on him/her with a new author, because the new author is using the original author's world. It would be like dating the high school quarterback and then when he breaks his ankle, you start dating the new quarterback. At the same time, if the original author gave his/her blessing, I think I would be okay. Robert Jordan and his Wheel of Time series comes to mind. He okay'ed Brandon Sanderson to finish the series, so I feel alright reading Sanderson's books (if I ever get to that behemoth of a series). Now it is your turn! Do you continue with a series even after the original author has stopped writing for it?